I asked my mother to share some of the wellness wisdom she's learned from a long line of long-lifers. 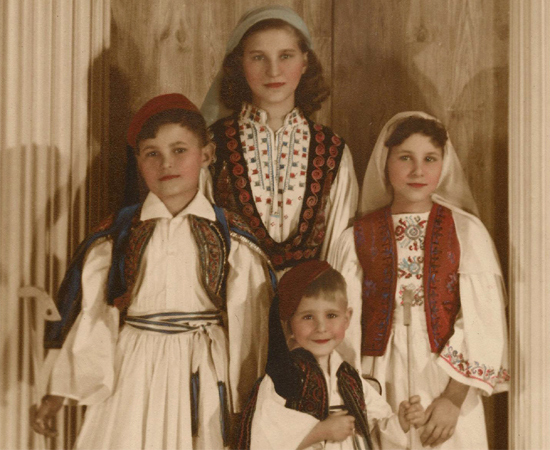 My mother and her siblings are wearing the traditional costume of our village, Karyai. My husband, ethnobotanist and Medicine Hunter Chris Kilham, recently appeared on The Dr. Oz Show to talk about a recent study showing that Greek coffee makes the inner lining of blood vessels healthier, increasing longevity. When Chris mentioned his mother-in-law, Becky Castanas Greene, by her full name on the air, he won big points with my mother and with the greater Greek tribe. Well done, honey. My mother has memories of elderly Greek ladies gathering at each others' houses and brewing up rich, thick coffee that they served in special demitasse cups, often passed down from mother to daughter, with small cakes or pastries such as kourabiedes or koulourakia and a heavy dose of girl talk about families and the old country. Men would usually go to the cafeneion (coffee house), where "they'd sit around sipping coffee while solving all the political woes of the world their way," she says. Time and the great melting pot of America aside, my husband and Dr. Oz agree that drinking Greek coffee contributes to heart health and longevity. That said, I also know there's a lot more to Greek longevity than consuming a couple of cups of specially brewed coffee each day. I know this because my mother's family has a history of longevity that would impress pretty much anybody. My mother, Ewanna "Becky" Castanas, turned 80 this past December. Her parents met in the United States but were both originally from Karyai, a beautiful chorio (village) on a mountain peak between Sparta and Tripoli. Like the island of Ikaria in the recent Greek coffee study, my relatives from Karyai have an impressive longevity record. My papou (grandfather) lived to be 96. His father lived to be 100. His father's father lived to be 98; his father's father's father lived to be 105; and his father's father's father's father lived to be 110. "Women's births and deaths weren't so carefully documented," my mother explained, although she knows that her mother, my yaya (grandmother), lived to be 93. Love deeply. Love deeply the people in your life and love deeply in general. Love animals, plants, the planet, and the arts. Everyone loves differently. Think of the people you love in your life, and how they love: each one unique. Be honest. Speak your truth and then be where you are in that freedom. I was always a truth-seeker. I wanted to know the truth. Have no secrets. Don't let anyone tell you to "keep your mouth shut." Holding things in causes all kinds of problems, including health problems. There's no doubt about that. Live free. "Eleutheria i thanatos" ("freedom or death") is Greece's national motto. The Greeks have a long history and at times have been enslaved or enslaved others. Having experienced both sides, they learned to value freedom as essential to life. Let it go. Hold no grudges, resentments or regrets and do not envy others. Bitterness can kill you from the inside. If you have envy, be honest with yourself about it and do everything you can to take care of that envy. Ask yourself, "Why do I get that feeling?" Sometimes I'll go to a person I'm holding a grudge against and I'll say, "I've always felt a grudge and I don't have it any more." And that's that. Release it. Come to terms with it. Accept it in yourself, then drop it. Learn something new every day. People who don't grow become boring. You can bore yourself, too! A day without learning something new is a wasted day. Share what you've learned. When your father and I walk on the beach, or maybe over dinner I ask him, "What did you learn today that you didn't know before?" And that's what we talk about. Don't be afraid to ask for advice and listen to others' opinions. Then be open to change -- even big change -- in yourself. Seek beauty. Seek what is beautiful to you and surround yourself with that beauty. Beauty for all your senses: sight, sound, touch, taste, smell. Beauty feeds the spirit and keeps the cup full, and not just for you. When you create beauty you are also inspiring others. Feed your body. Breathe good clean air, eat good fresh food and drink good clean water--with no added chemicals. The Mediterranean diet's benefits are well documented. Move your body. It doesn't matter what you do: garden, walk, dance. Moving your body keeps you strong and flexible and keeps the blood flowing. Your father and I walk together every day, no matter where we are in the world. Community counts. Spend time with friends and family. Try to have friends from all walks of life and of different ages. The Greeks gather as a community and dance late into the night. Every generation, all dancing together. I grew up around that. It was great exercise, but mostly it was about celebrating the joy of life together as a tribe. Marriage matters. Married people live longer. Greeks don't divorce easily. My father used to say, "You're born once, you marry once, and you die once." That's an old village saying. He would tell me, "We marry for life." I guess that stuck for me. I wanted it to be right. Staying in love for life takes work, but it's worth it. You have to be really a friend with your spouse in all the best ways. Don't quit too easily; any worthwhile, lasting relationship takes constant commitment. That said, staying in a bad relationship can be unhealthy. If you can't fix a bad relationship, get out and learn from that experience but do try again because when it works, it's worth it. Spend time with nature. Get outdoors. Spend time with nature in her many forms. If you like to garden, garden. It you like to walk, walk. I see the ocean every day. I see the light sparkling on the water or the moon reflected in the waves. I watch the sunrise and set. Spending time in the natural world will center, heal, and inspire you. It helps you gain perspective on being human. Stay current. Keep up with the times. If you allow yourself to get stuck in the past, you will surely grow old. Keep an open mind. Move beyond your comfort zone and open your mind to new ways of thinking. Learn how to use new tools and technologies. Have something to look forward to. I can't stress this enough how important this is! I learned this when I worked in a factory and looked forward to the end of that gig. The people who felt they would work there for life looked forward to Friday night at the pub, and they would always talk about it all the time. That got them through the week. See the world! Travel enriches your life. Travel shows you real cultural, scenic and wildlife diversity -- and nothing takes the place of firsthand experience. Staying put too long I get cabin fever. I could stay put if I had to but I would find it oppressive. Your father and I love to travel together. Work. In my mother's community, people thought something was wrong with people who didn't work. They thought, "If you don't work there's something wrong with you." It's always best to do what you love, but no matter what, go about your work cheerfully. Be grateful for the work you have and do it to the best of your ability. Blind work, like working to keep up with Jones, is never healthy. Read. Reading wasn't encouraged in my house when I was growing up. There was work to do. I discovered the world of books in college but it wasn't until the kids left the house that I started seriously reading both fiction and knowledge-based nonfiction. Now I read more than three books a week, which takes me to other worlds, keeps my mind sharp and opens me up other ways of thinking. Play. Social skills are very important in life and if you miss learning about them as a child they are very difficult to pick up later. Being social and being socially adept is part of a long a life. When a person is socially inept that can lead to loneliness and isolation, and both of those things can be terribly unhealthy. Growing up during the Great Depression and then World War II, we would get together in the neighborhood and play games like kick-the-can and Tarzan and card games. Playing with other children taught me about give-and-take, and about how we each have strengths and weaknesses. Be needed. People who don't feel like they're needed lay down and die. Some people shy away from needing and being needed because they're afraid of being "needy." Needing someone and being needy are very different. Needing and being needed is healthy. Balance in all things! Balance in all of the things above! You can take that word balance and you can go through this entire list! My father used to say, "everything in moderation," but I think the word "balance" is a much better word. It is just so much broader. Moderation is good, too, but the immoderate people are the ones that go beyond moderate and they are so often the people who end up doing great things for the world. Great scientists and artists and thinkers are rarely moderate people. Balance is different. Think of a horse. If you're on a horse and you lose balance, you fall off. You need to stay on the horse and ride, fast or slow, to get where you're going. My mother, Becky, and my father, Bill, have traveled the world together. This shot was taken a few years ago in Greece. 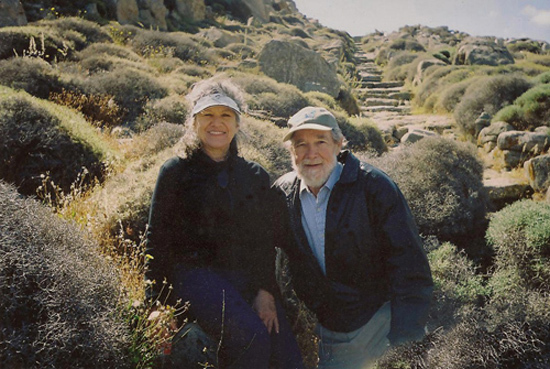 They now live in New Zealand, which they discovered 50 years ago on an epic round-the-world honeymoon adventure. Happy Mother's Day, Mom! Love you.